Trying out IPL at the Strip Mobile! | beauty. bikes. Trying out IPL at the Strip Mobile! Dropped by the STRIP Mobile last week and tried out their IPL! Got a trial zap on my navel and it didn’t even hurt! I remember the IPLs 6 years ago.. It was like a kid snapping rubberbands on your skin. But technology has improved and STRIP’s IPL is virtually painless. They apply a freezing cold gel on the skin before zapping the life out of your hair follicles. From today till 11th Aug, the cute STRIP mobile will be parked at Cineleisure Orchard. 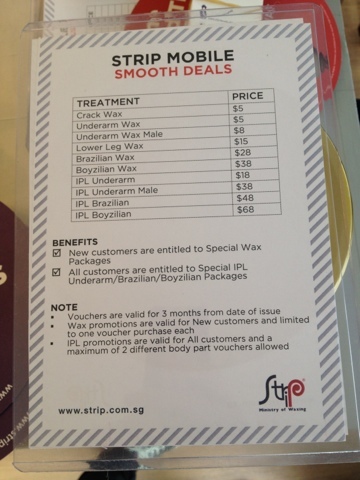 Drop by to purchase your vouchers for waxing and IPLs at uber fab prices! And if you want it fast, you can get waxed onboard the STRIP mobile too.